What kind of coins Cheng Ho would likely have had on board his ship during his sixth and seventh voyages? I also need to know what coin would definitely not be included. These two questions are quite interesting to me. Do you think you can answer these questions? I am happy to give you some hints below about Cheng Ho's voyages and also the email received from Mr.Barry LeMesurier of Torrance on April 25 2003. I am amazed at the volume of Chinese coins. I'm trying to determine what kind of coins Cheng Ho would likely have had on board his ship during his sixth and seventh voyages. I am writing a screenplay. I also need to know what coin would definitely not be included. I.E. were Roman coins still in circulation then, would Japanese coins be used in China?. Any advice or direction would be greatly appreciated. Before Chu Yuan Chang founded the Ming Dynasty, he proclaimed himself the Duke of Wu and minted Tai Chung Tung Pao cash in 1361. Later, he established the Pao Chuan Chu in those under his control provinces in order to mint the Tai Chung Tung Pao in five denominations including one cash, two cash, three cash, five cash and ten cash copper coin in about 1364. In the set of the Tai Chung T'ung Pao cash, normally one cash coin bore only one Chinese character to show its place of origin or no character on the reverse, the other coins bore an additional Chinese character to denote their respective denominations. Provincial Mint names were found appear on the reverse including Kwei Lin, Fu Kien, Shun Tien, Chih Li, Che Kiang, Ho Nan, Pei Ping, Shan Tung and Kwang Tung. Reverse: No mint mark on the reverse. Chu Yuan Chang (Emperor T'ai Tsu; Title: Ta Chung) ascended the throne as the first emperor of the Ming Dynasty in 1368. His reign title is Hung Wu. He used Nanking of Che Kiang province as capital. He had introduced a quite complicated coinage including 4 varieties [Reverse bearing: 1.plain reverse; 2.mint of origin 3.value of cash; 4.value of silver] and five denominations similar to the Tai Chung T'ung Pao. There were about 61 different kinds of Hung Wu T'ung Pao. Later, Ming used paper note again for the widespreading of forgery and shortage of bronze, the Ming government revived the using of paper money just as the Yuan Dynasty. From 1375, because the issue of the paper money Tai Ming Pao Chao, Hung Wu T'ung Pao coins ceased production in 1376. But the production resumed again in 1377 until 1387 when the paper money with small denominations was issued. After 1393, no cash coins were cast and copper cash were prohibited for circulation by the Ming government. Pao Chao system and silver taels were adopted for daily exchange purposes in various places. In quite long period of time, only a small amount of copper coins were cast. Obverse: Legend in Chinese characters Hung Wu T'ung Pao. Chu Ti (Ming Cheng Tsu), the fourth son of Emperor T'ai Tsu became the Emperor of Ming empire in 1402. He used Yung Lo as his reign and transferred the capital to Peking from Nanking. Yung Lo Emperor revived the Ming navy by dispatching a great fleet to visit countries in South-East Asia and the Indian Ocean. A shipyard was built at the new capital of Nanking and also a school for training foreign languages was established by the Yung Lo Emperor. In 1405, the Ming Emperor sent Cheng Ho (Zheng He) [1371-1435] as commander to started his first voyages with 62 large ships, 4 of them were approximately 138 meters long and 56 meters wide. They were the largest ships ever built in history. The Ming fleet was embarked with abount 28,000 men. The ships were filled with many Chinese goods for trading with other countries during the voyage. Cheng Ho, a Muslim from Yunnan province, who proved an excellent envoy with his great seaborne expeditions, he even reached as far as the east coast of Africa. Emperor Yung Lo issued Yung Lo T'ung Pao in the sixth year of the Yung Lo reign (AD1408), but only limited numbers minted sporadically. Together with the development of foreign trade, many of the Hung Wu and Yung Lo cash coins were transpored to Japan from China following the maritime trade of the three provinces of Kwangtung, Chekiang and Fukien. On the other hand, at the end of the 10th century, the power of the Japanese government weakened, so the Japanese government suspended the mintage of coins. During the middle of the 12th century, the Japanese Heian government did not cast cash coins. 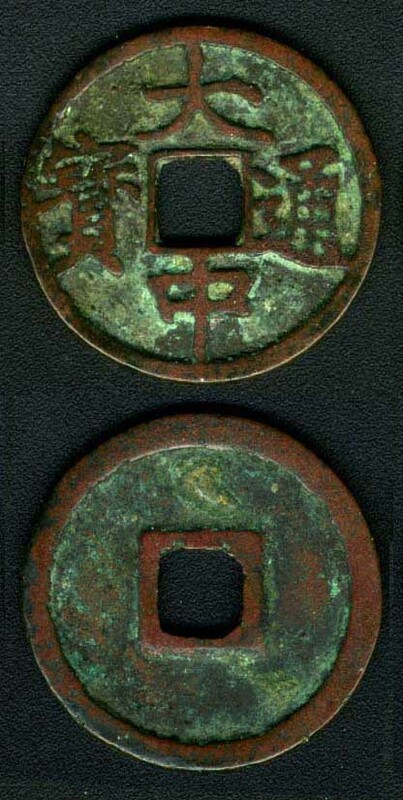 The Japanese government officially allowed people to use Chinese coins for the local market in 1226, so that various kinds of Chinese coin (mainly including coins of Sung and Ming Dynasty) imported from China were used as money in Japan until the Edo Period (1636) [some of the Chinese scholars believe that the latter date is 1670]. The imported Chinese coins were known as "Toraisen" in Japan. Nowadays we still find Chinese coins easily in Japan. Obverse: Legend in Chinese characters Yung Lo T'ung Pao. During the Hsuan Te period (1426-1435), Emperor Hsuan Tsung (Chu Chan Chi) also issued a small numbers of Hsuan Te T'ung Pao cash coins. Later in 1527, the Emperor Shih Tsung (Chu Hou Chung) also issued a supplementary issue of these coins in lighter weight. I have another Hsuan Te T'ung Pao cash with the same diameter, its weight is 3.1 grams only. 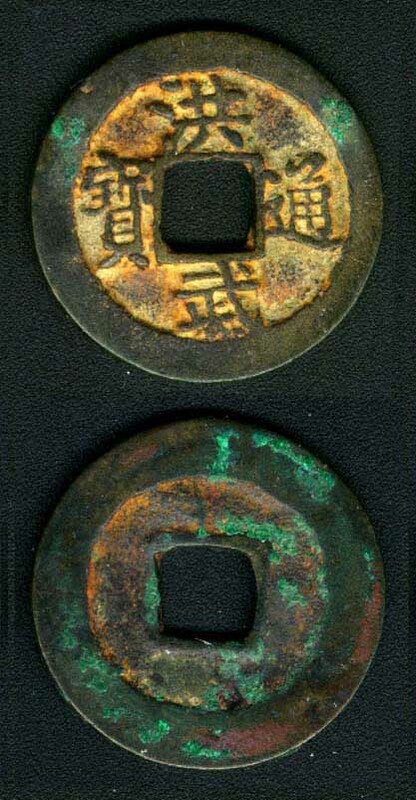 Japanese, Annamese and Korean cash which were strongly influenced by the Chinese coinage system with Chinese dated inscriptions started to circulate from seventh century. Together with the development of foreign trade, foreign copper cash continued to circulate within China from the middle Ming Dynasty. Actually, forign copper cash still circulated occasionally during the early Repubic period. Obverse: Legend in Chinese characters Shuan Te T'ung Pao. About a century after the closure of the various provincial mints in the reign of Hung Wu, no copper cash were cast during the period of Hung Hsi (1425), Ching T'ai (1450-1456) and Cheng Hua (1465-1487). In the early years of the Ming Dynasty, the main form of paper notes system of Tai Ming Pao Chao was quite stable. However, it was almost abolished in the Hung Chih reign (1487-1505). Emperor Hsiao Tsung (Chu Yu T'ang) issued Hung Chih T'ung Pao cash in the sixteenth year of Hung Chih reign (1503), it was because he understood that the failure of the currency system of paper money in the empire. He ordered to mint the new copper cash of Hung Chih T'ung Pao coin, but only limited numbers minted. Two years later, Emperor Hsuan Tsung passed away. Some of the scholars suggest that Hsiao Tsung did not issue any coinage and the Hung Chih T'ung Pao cash was part of a supplementary issue made by the Emperor Shih Tsung in 1527. I cannot prove this now until I have a further study of Ming coinage. As I know that the majority of copper cash circulated in the Ming Dynasty were of the T'ang and Sung periods with Sung cash predominating. Obverse: Legend in Chinese characters Hung Chih T'ung Pao. After, you have read this page, you should know the answers of the above questions. Hung Wu T'ung Pao and Yung Lo T'ung Pao copper cash would likely have had on board Cheng Ho's ship during his sixth and seventh voyages. Copper cash minted later than Yung Lo T'ung Pao would definitely not be included.